oftwominds-Charles Hugh Smith: Where are Europe's Fault Lines? Beneath the surface of modern maps, numerous old fault lines still exist. A political earthquake or two might reveal the fractures for all to see. 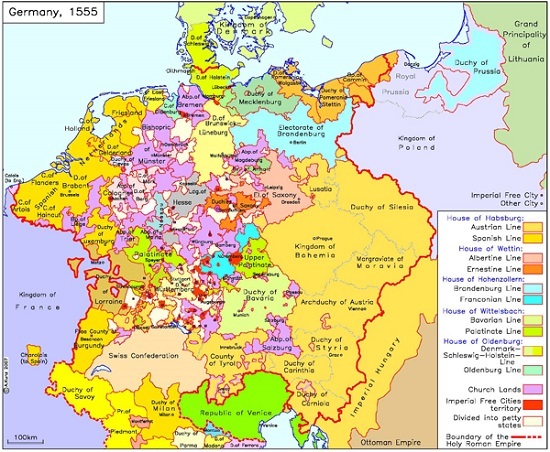 Correspondent Mark G. and I have long discussed the potential relevancy of old boundaries, alliances and structures in Europe's future alignments.Examples include the Holy Roman Empire and the Hanseatic League, among others. In the long view, Europe has cycled between periods of consolidation and fragmentation for two millennia, starting with the Roman Empire and its dissolution. Various mass movements of tribes/peoples led to new political structures and alliances, and a dizzying range of leaders rose to power and schemed their way through an equally dizzying array of wars, alliances and betrayals. Regardless of the era or players, security is a permanent priority: this includes defensible borders, alliances to counter potential foes, treaties to end hostilities and whatever is necessary to secure access to resources and trade routes. When consolidation served these priorities, then fragmented polities either consolidated by choice or by conquest. When smaller polities served these priorities, then imperial structures fragmented into naturally cohesive territories that were unified by language, culture and geography. Security is also economic, as people support structures that keep their bellies filled and enable social stability and mobility. For the sake of argument, let's say that the European Union is the high water mark of consolidation, and the next phase is fragmentation. Where are Europe's natural fault lines? Much has changed in the past 600 years, but geography hasn't changed, and that defines some basic security threats. Nation-states may appear permanent, but history suggests nothing is as permanent as we might reckon. Polities that were brought into an Imperial orbit but retained their identity and geographic boundaries may be last one on, first one off. In other cases, old fault lines were merely blurred rather than erased. Brexit is a one-off in some regards, but if we add Catalonia, we discern the possibility of reversion to older borders and configurations. Could Italy fragment into three polities, North, Rome and the South? The idea seems absurd, but the history of modern states is based on much older structures--structures that made sense then and might once again make sense. Insecurity feeds fragmentation. Once borders are no longer secure and social stability and mobility decay, people naturally start looking around for solutions, and configurations based on language, geography and culture start looking attractive if the current arrangement is seen as decreasing security rather than increasing it. Empires tend to fail when the centers of power become self-absorbed in political struggles while the prosperity and security of the imperial lands decline. If we view the EU as a modern-day iteration of Empire, it's not terribly surprising that the decay of social stability and mobility are fraying the forces holding the Empire of the willing together. 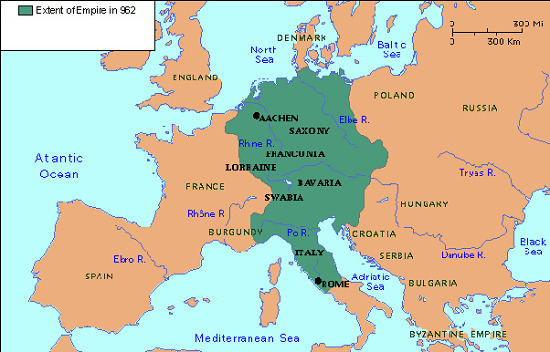 Here are two maps of the Holy Roman Empire, the first circa 962 AD, and the second circa 1555. It seems the bonds between Eastern and Western Europe aren't as strong as the forces of geography, language and shared security interests binding the polities within the Western and Eastern blocs. I'm not making any predictions here, just noting that not all boundaries are lines on a map. Beneath the surface of modern maps, numerous old fault lines still exist. A political earthquake or two might reveal the fractures for all to see. Thank you, John B. ($5/month), for your superbly generous contribution to this site-- I am greatly honored by your support and readership.